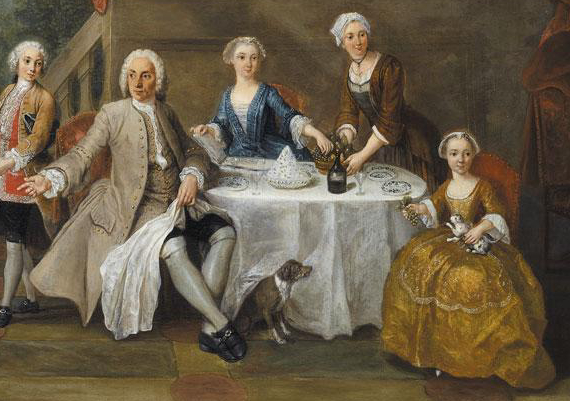 Meals were an important time for displays of wealth and social standing in the early modern period. Visiting Montréal in 1749, the Swedish botanist Pehr Kalm described how "people of quality have a great variety of dishes, and the rest follow their example." Like their peers in France, elite colonists in New France owned a variety of ceramic objects upon which to serve everything from soups and ragoûts to meats and desserts. Archaeological excavations have unearthed numerous ceramic forms and types ranging from faïence (tin-glazed earthenware) and Chinese porcelain dinner plates to more utilitarian objects including chamber pots and inkwells. Decorative ceramic tiles even found their way into interior architecture. In addition to identifying types and quantities of ceramics, colonial inventories sometimes include descriptions of their place within domestic interiors. Rather than being relegated to kitchen areas or hidden away in an armoire, buffet, or cupboard, some were prominently displayed in public spaces of elite homes. Cups and saucers, for example, were often arranged along mantlepieces as garnitures alongside ornamental vases and other vessels. According to his probate inventory, the royal notary Jacques Barbel owned six coffee cups and saucers displayed on the cornice of the mantle in the salle, or public room, of his home in Québec in 1740. These were described as glazed earthenware. In 1742, Marie-Madeleine-Louise de Saint-Vincent's probate inventory records six cups and saucers arranged on the mantlepiece in her salle. Their ceramic type is not identified, but it is likely that they were used by Madame de Saint-Vincent, baronne de Narcy, in the consumption of coffee or chocolate. ​Setting ceramic drinking wares and other ceramics and glass on mantelpieces was not a colonial decorative conceit. A detail from the 1765 edition of the Encylopédie depicts the practice of arranging cups and saucers on mantels in France. As late as the 1830s, Anglo-American visitors and probate inventories described the same sorts of cup and saucer displays in creole homes in Louisiana. Findings such as these provide useful details for envisioning the appearance of and activities performed within elite French colonial homes. They also serve to underscore colonial emulation of metropolitan decorative conceits. Read alongside period observations and descriptions found in diaries, letters, and inventories, contemporary French art provides a helpful visual resource for envisioning colonial interiors, material culture, and social rituals including those related to dining and the use of ceramic objects.